Resolve all of your plumbing issues with the services from Hudson Plumbing Heating & Air Conditioning Inc. in Tulsa, Oklahoma. 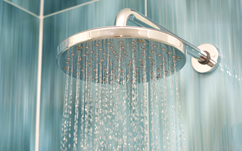 We perform a variety of jobs, including expert leak repair and shower installation. Our team does not work on commission, so you are never sold any parts or equipment you don't need. We carry Rheem and A.O. Smith hot water tanks, as well as tank less water heaters. Contact us today to begin planning your dream bathroom or kitchen!